Mr. S. Elilan, the political head of the LTTE in Vavuniya, and Ms. Alai, the head of the women’s wing in Vavuniya, accompanied the five newly elected TNA MPs, Messrs N.Sivasakthi Ananthan, Selvam Adaikalanathan, Sivanathan Kishore, Sathasivam Kanagartnam and Vino- Subramaniam Noharathalingam, during their visit to the cemetery. 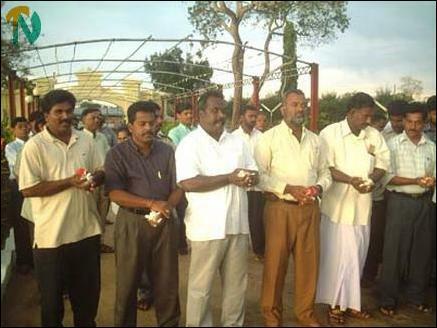 Elilan the Political head of the LTTE in Vavuniya, newly elected MPs for Vanni N.Sivasakthi Ananthan, Selvam Adaikalanathan, Sivanathan Kishore, Sathasivam Kanagartnam and Vino- Subramaniam Noharathalingam are seen in the picture. Ms. Alai, head of Women LTTE Political wing in Vavuniya, offering flowers to the Martyrs.